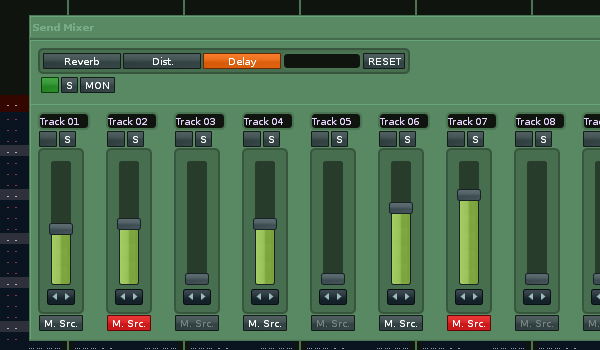 Also has a MON button (toggle) which lets you hear the audio from the sends only. In renoise if you solo a send you still hear the output from the tracks pointing to it. The MONitor function adds Silent Gainers (-INFdB) to each track so that all you hear is the audio flowing through the send tracks. While Autosolo is checked and MON enabled, simply click each individual send track button to hear it`s true solo output. To hear all sends together, disable Autosolo. Note: Autosolo option only becomes visible when MON is engaged. If you get in a muddle with solo/ mon states just press the RESET button and all goes back to default. You can rename tracks in the textfields and a special renaming textfield is provided to rename the target send track. fixed a bug where send [M. Src] buttons were not being updated properly on groups.